Maremma Tuscany in November is simply magic. If you have ever thought of taking a short break in the late autumn in Tuscany but didn't because you thought it would be too cold or that there wouldn't be anything to see or do, then this page is for you. Be prepared to change your perception of Tuscany forever! Letting your children run and run and dig and build sandcastles on a beach with no one else in sight until the last rays of the day have gone and it really does have to be time to go home, even if the protests are many. 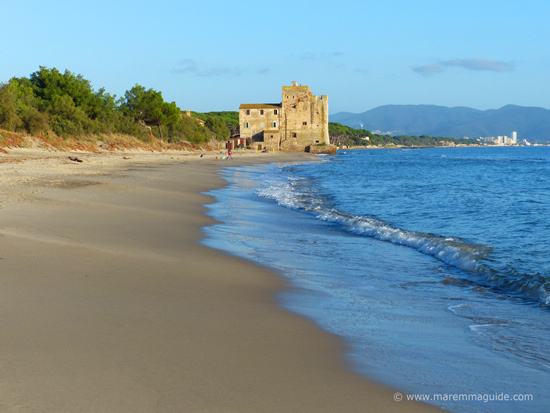 This beach is called Torre Mozza - officially a Piombino beach, but situated much closer to the seaside town of Follonica (the buildings in the far distance) than the city port - in the beautiful coastal reserve of the Parco della Sterpaia. It has an old Roman road running the length of its shallow waters - a favourite snorkelling spot for many - and a medieval tower from which the beach takes its name. Yes, I'm serious! The last couple of years have seen the weather at the beginning of November match summer days in the UK :) I had a friend staying for a weekend and took her to see the gorgeous cove of Cala Violina and we basked in the sunshine on the sands after the trek to reach it through the woods. She even send a photo from her mobile phone to her husband back home to make him jealous and to prove that she wasn't winding him up! But these visitors went well prepared and made the most of having the beach practically all to themselves. Bliss. With not a beach parasol in sight, this is Castiglione della Pescaia beach on a Sunday afternoon. And this is the view from the same spot of this pretty towns two lighthouses that guard the entrance to its fishing port. 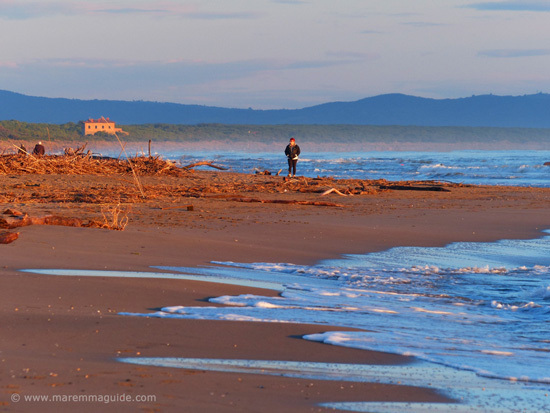 Maremma's beach sunsets are always spectacular anytime of the year, but there is something extra special about basking in the last rays of a warm November sun on a beach with the waves rolling onshore, whilst watching the skies become a painters dream canvas... 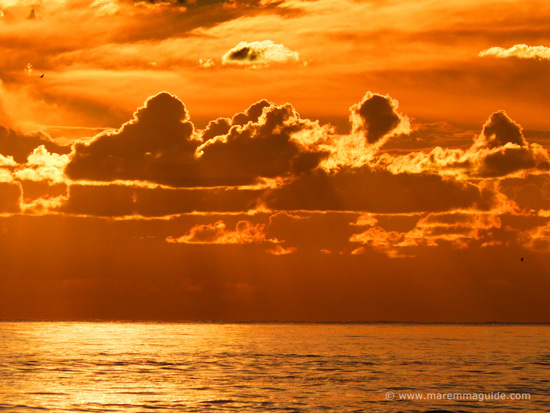 Ever changing hues and triumphant blazes of orange and red to the last. And when the chill of the evening hits quickly afterwards, popping home to a log fire or doing some shopping in medieval streets with all of the shops lit-up and the Christmas goodies in store. Taking a drive armed with a map after lunch and finding the ruins of a medieval castle hidden in woods. Now, whilst that may sound a bit odd, you need to know that nearly every hill top in Maremma was once a medieval stronghold (under which you will often as not find even older Etruscan foundations), long since abandoned and overgrown by Mediterranean macchia and helm oak woodland. Now their position on an Ordnance Survey map may well be marked with one of those historic site icons, but finding the ruins when you get anywhere close is another thing altogether. Trust me, I have the experience of returning home empty handed more than once to prove it! This one - that I finally found! - was once the home of an important Maremma Lord, suspected to this day of having murdered his wife by having her thrown from its windows, in order that he could marry his true love (and the heiress to a substantial part of Tuscany!). If only the walls of the Castello di Pietra called talk, boy oh boy would we be riveted to their words. 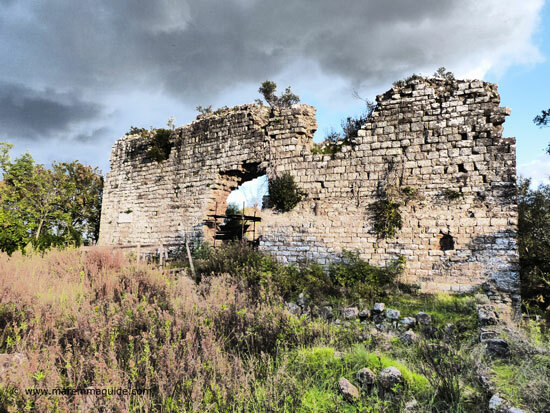 So, if castles fascinate you, and secret, ruined, hidden ones at that, then Maremma in November, when there isn't the heat of a summer sun to scorch your efforts, is a perfect time to go exploring. Birding in Tuscany to write home about! 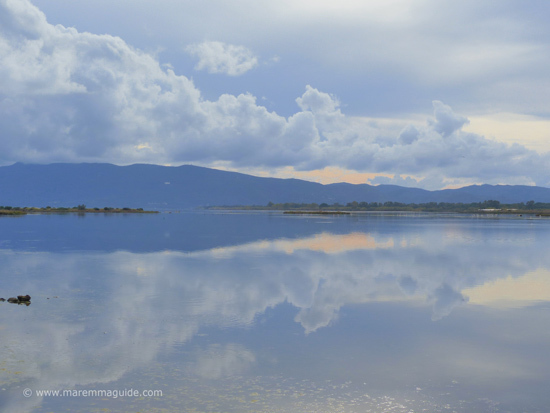 November in this part of Tuscany is going out and filling your camera card to the brim with images of pink and white wading birds that come here every year to over winter in the very special wetlands and marshes of Maremma. 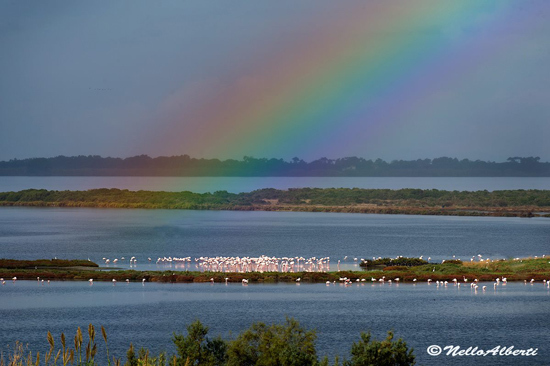 Pink flamingos on the Orbetello Lagoon in early November by Nello Alberti. And when you have done with watching the feathered wildlife, there are shy crabs walking sideways in the shallows, and huge "Spigole" (Seabass) splashing about in the water whilst swallowing other smaller fish, to watch from a wooden hide in the Riserva Naturale ed Oasi della Laguna di Orbetello. 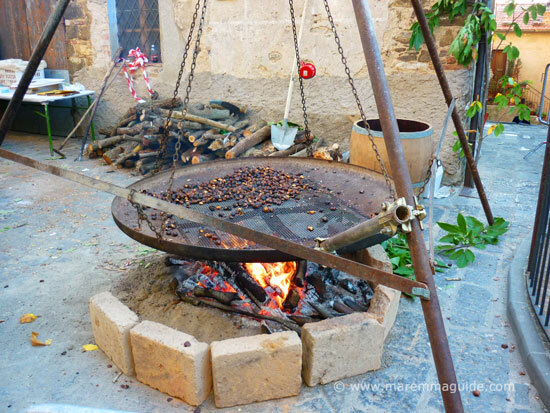 In the hill towns the main piazza becomes the stage for huge metal roasting tins hung from a tripod by chains over a log fire, filled with local chestnuts collected from the woods. And home to live traditional music, face painting for the kids, and stalls serving bruschetta generously drizzled with the new olive oil. The menus of the local "sagre" - food festivals - and restaurants are full of traditional porcini mushroom and chestnut dishes too. Including a traditional Tuscan chestnut flour-based dessert called "Castagnaccio", the recipe for which dates back to the sixteenth century. With mittens and scarves on, everyone is out late socialising and celebrating the change in season. A visit at this time of year will see you warmly welcomed and very well fed! 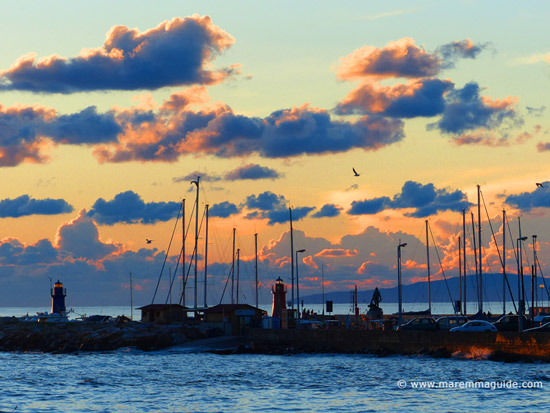 Maremma events in November and the food festivals. 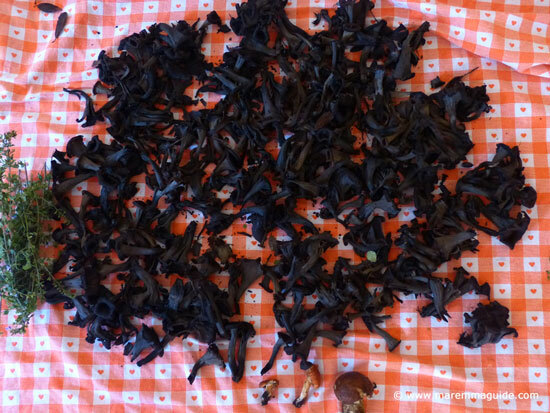 And those who aren't out picking olives are in the woods mushroom hunting. 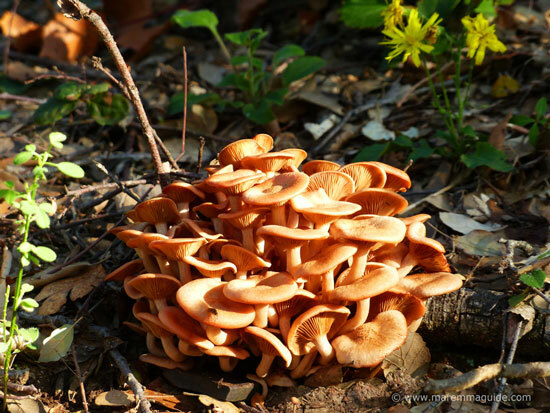 The "fungaioli" (mushroom hunters) voracious hunt for porcini in October and the beginning of November ceases, and the search starts for the less famous varieties of "funghi", such as "Dente" and "Trombetta die morti". Picking some aromatic Nipitella herb along the way too to add to the risotto! NOTE: If you are visiting Maremma you will need a permit to pick mushrooms, and open weave basket to put them in (plastic bags are forbidden - you need to leave the spores for next year). And, importantly, check your finds with the experts at the local ASL office before eating them, just to be sure. Better still, join the hosts of the farmhouse or your bed and breakfast on their foraging, or one of the local guided woodland walks in Maremma's metalliferous hills or on Monte Amiata. Maremma in November also brings with it an opportunity to go underground with the Spelogiolo Society of Massa Marittima on a - free - guided tour of a subterranean Tuscany only recently re-discovered and that no one else you know will ever see. There is wildlife down there too! Set in the stunning medieval setting of Massa Marittima, a whole month of events - most of which are free. From guided tours of the medieval city, one of which will take you into tunnels normally closed to the public beneath an important and central "palazzo" (medieval city building). 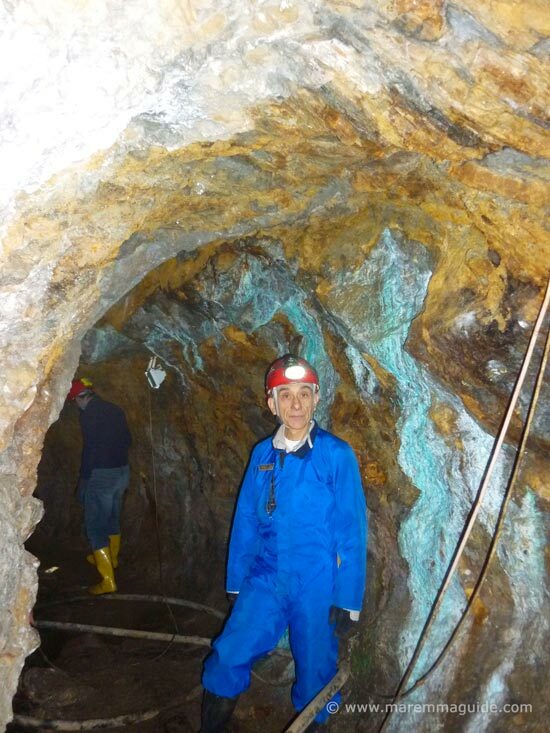 To guided treks around the nearby geothermal landscape of Monterotondo Marittima, and other geological and mining sites in the surrounding metalliferous hills. Etruscan food and local wine tastings, medieval costumed dinners, concerts... and more. Plus all of Maremma's museums have free entrance for the whole month, including the wonderful Torre del Candeliere from the top of which is an incredible panoramic view of the "old town" below the "new town" behind, the Gulf of Follonica and the islands of Montecristo and Isola d'Elba. That is if you can overcome a fear of heights on the steps up!